I got my first horse when I was four, she was a pony actually. Her name was Freckles. She had been neglected and abused and suffered from severe laminitis. My Mom and I nursed her back to health and she lived out the rest of her life happily with us. Freckles passed away in January of '97. You can see a picture of Freckles on the "In Memory Of" page. My second horse, Gypsy Moon Dance (Gypsy) is now 21 years old. She is a registered Appaloosa mare. She carried me to the the local Cowgirls Association 3D Barrel Racing Championship in 2003! She has a heart of gold and is currently enjoying semi-retirement.�I got her when she was 10 and she had never really had any training. What a handfull for a 12 year-old girl! She had had very little work done with her, and what she did have done wasn't exactly a positive experience. Every problem or fear that a horse could have, Gypsy seemed to have. With the right training, patience, and many, many, miles, Gypsy turned out to be a great horse. To see more on Gypsy, click on the "Get to know Gypsy Moon Dance" link. I always wanted a "Lassie dog" as a kid. For my eighth birthday my Mom gave me a collie puppy! I named her "Heather's Country Miss," Missy for short. Missy was a purebred, registered �(rough coated) collie. We used to raise collies, Missy had three litters of puppies. At age 13 Missy was diagnosed with cancer. 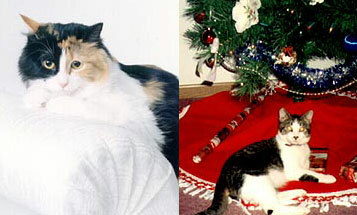 She wasn't doing so well and had to say my final goodbye to her in November of 1999. I have to mention my brother's dog Duke. He was a Husky, Shepherd cross. Duke was a very pretty dog, but just plain crazy. If there was a loony bin for dogs, he would have there! Duke had gone through several windows in our house, he likes to carry zucchinis around in his mouth and perch on the roofs of our vehicles. NOT COOL! Oh, ya and he liked to carry around kittens by their heads. Definitely NOT COOL! The one thing Duke was good for was keeping my horse and I company on long rides around home. He would follow us every where and had a blast chasing deer and anything else that moved. Unfortunately Duke wandered off during the winter while he was with my Dad and was hit by a car. He will be greatly missed. Here's a picture of "Glamour Girl," Patches! I have had lots of cats through the years. I have two cats that live with me now. One is Patches, she is a beautiful long haired calico. My other cat is Cheston, he's tabby and white. Cheston is quite a character, always into everything! Patches is a bit timid and Cheston is fearless! In September of 2002 a speckled bundle of joy came into my life. She is a Blue Merle Australian Shepherd named Tess. I just love having her around, to see more on Tess go to the "Heart Mountain Tess" link. There have been several special pets in my family that have unfortunately crossed over the "Rainbow Bridge." Check out the link "In Memory Of" link.